Can you make more power with the same basic piston in high-output situations? The answer to that is an emphatic yes! 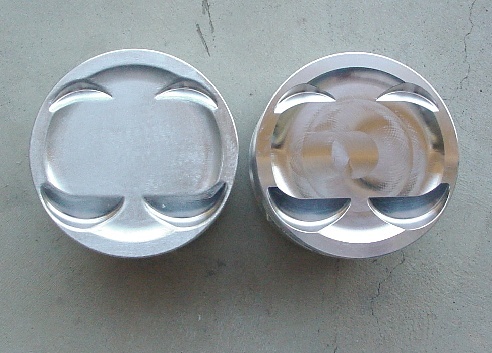 Custom piston manufacturers sell semi-finished pistons. Their tops, or domes (both positive and negative) are machine-finished and they have "edges" everywhere. Since the piston is the floor of the combustion chamber, take a look at the dome from the combustions viewpoint. People spend a lot of time and money removing sharp edges in the combustion chambers of the head, so shouldn't the same rules apply to the bottom of the chamber? The obvious answer is yes. The pistons in this picture are of the "generic" dome design for a boosted engine. During our high boost dyno testing, we found another 28 HP (on a 340 HP engine) by reworking the piston tops as shown in the picture. Some complain about the lack of "shine" to our modified unit, but the combustion chamber is the one looking at the piston in the real world and chambers don't like to see themselves in mirror-like domes. Not a sharp edge to be found. Piston finish is typically accomplished with carbide removal of material for shape, followed by 120 grit resin bond cartridge roll, light hand sanding with a 3-M medium grit sanding "sponge", followed by medium Scotchbrite (by hand). Chambers can be finished the same way, assuming you steer clear of the valve seats. A more detail article with additional pictures will follow.